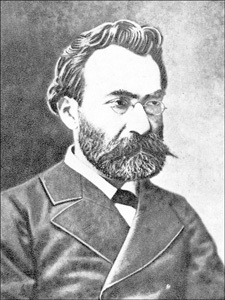 From 1872-76 he contributed to the newly published Mshak daily in Tiflis. He debuted with the penname Alexander Raffi, which would later become just Raffi. He subsequently took teaching posts in Armenian language and history at the Armenian school in Tabriz (1875), where he put into practice his modern educational values. Two years later, he had to leave the city due to his conflict with the conservative establishment, both Armenian and Persian. He took a teaching position in Agoulis, in the region of Nakhichevan, but in 1879, his progressive views became again a matter for clashes with the local wealthy sponsors, and he settled in Tiflis for good, where he continued his prolific work for Mshak . The newspaper would publish many of his novels in serialized form. A year before he had published to great acclaim his first book, Jalaleddin, a novel depicting the massacres of Armenians by a Kurdish chieftain in the southeastern corner of Western Armenia. The next critically and popularly acclaimed book would be the novel The Fool (1881), whose subject was the Russo-Turkish war of 1877-1878. In the following years, the patriotic imagery and episodes of both novels would inspire many young people to devote themselves to the cause of the liberation of Western Armenia, which would end in the creation of revolutionary groups and then political parties. Anna Raffi, the writer’s wife, later moved to London with his sons Aram and Arshag. She would be instrumental in the publication of Raffi’s unpublished works, as well as reprints of his already popular novels. Her sons would have an important literary and political activity in the British capital to the benefit of Armenian causes. Raffi’s works, prohibited in Soviet Armenia during Stalin’s time, were published in huge multivolume editions afterwards. Presently, there is a school as well as a street named after Raffi in Yerevan. His works have been translated into several languages, such as English, French, Spanish, and others.